I’m so happy to have guest blogger Kendra Thornton on the blog today! Since Halloween is right around the corner, she’ll share some of her family’s favorite things about the holiday. Stay tuned tomorrow for Part II, when I’ll talk about my family’s traditions! Enjoy! Much like Christmas seems to come earlier every year, it feels like the moment the calendar flips over to October, we are bombarded with all things Halloween. Well, you won’t hear any complaints from my house. My little “goblins” love this time of year. Everyone gets a chance to be creative with their costume picks. This is also the official start of my holiday baking season when my baking goes into high gear. Nothing can beat the smell of fresh apple crisp hot out of the oven. Sometimes, I like to whip up a crisp just to get the house smelling like fall! We now have special bins in the garage dedicated to holding all our Halloween decorations. Before we get out the witches and ghosts, we need to do the pumpkin carvings. After several seasons of practice, we’ve gotten pretty sophisticated with our jack-o-lanterns designs. Last year we invested in one of those pumpkin carving tool kits and it was a big help. So are the decorative stencils that I can download from the Internet. It’s really fun to see what other designs we can “borrow” from other expert carvers. Another trick we adopted was to use battery-operated candles inside. This isn’t as messy as traditional candles and also not a potential fire hazard. Everyone gets their own pumpkin for carving. As soon as they’re ready, out on the front porch they go but not before the pictures go up on Pinterest! As for this year’s costume creations, we’re still debating on the final selections. One thing I really appreciate is that my kids prefer to make their own costumes as opposed to taking the easy way out with store bought outfits. Not that there is anything wrong with that but making costumes has turned into family fun time and I wouldn’t miss that for anything. I’ve learned it’s better to start early with the costume creation rather than wait for the last minute. I also make sure the kids can see clearly out of their costumes and they are easy to move around in. Don’t want to have a repeat of the big foam banana incident from years past! On Halloween night, we’ve made it a tradition for hot cider and pumpkin chocolate chip cookies for the post-trick or treat candy sorting. The kids know they’re not allowed to sample any sweets until we’ve gone through them all to check for opened boxes or handmade items. The big sorting takes place on the dining room table. As each kid makes their way through their piles of candy, the trading starts. It’s clear by the end of the night who likes what! Of course, as mom I get right of first pick! This year we’ll be sticking around our Chicago neighborhood for Halloween. It’s going to be great because we’ve already gotten together with a couple of other families in the neighborhood so we’ll be going out in a group. Much safer that way! Even though it’s wonderful to have a holiday at home, I have to admit that one of our most favorite Halloween celebrations was on a trip to Orlando. At first, the kids got a little fussy about taking this trip. They thought they were going to miss out on all the trick or treat fun. Well that wasn’t going to happen; not as long as I could log into the Family Traveler’s tribe on Gogobot. That helped me find a whole bunch of other families who were staying in our same hotel. We got the kids done up in their costumes and put together some pillowcase trick or treat bags. Then we all went floor to floor. When some of the other guests heard us trick or treating up and down the hallway, they got into the act too by running to the candy machine for treats. A great time was truly had by all! Best of all, we stayed nice and warm the whole night! This year we have a bunch of cousins coming up for the big day and we can’t wait to see that side of the family! I’m looking forward to trying out some new recipes. Of course, for inspiration I always make a daily visit to Pinterest. There is always something new to see in the recipe department especially around the holidays. This is where I was inspired to make mummy pizza bagels. Not sure what kind of candy we’ll be handing out but whatever we settle on, I’m hoping I can use the leftovers in a cookie or pie. That way we can have the taste of Halloween for a couple of more days. How is your Halloween shaping up? Are you trying out any new recipes this year? Whatever you do make it a safe one and take plenty of pictures to share! Kendra Thornton: Travel advocate, TV spokesperson, PR businesswoman, proud wife and mama of 3. I am a long time travel expert who has been packing my bags and traveling the world since I was 3 months old! I’ve found my utmost desire in life is right here in my own home. 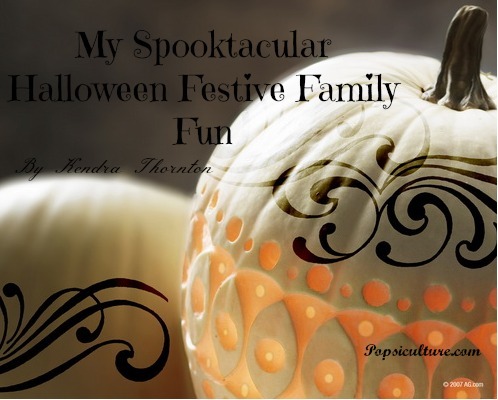 I enjoy collaborating with other moms to find the inside scoop on all topics relating to family fun!